Bella of London is an Italian inspired luxury sailing yacht - a masterful boat with all the comforts you could hope for. Sailing on the Bella is all about participating and enjoying the sport of sailing, from learning navigation, to helming and crewing the boat. 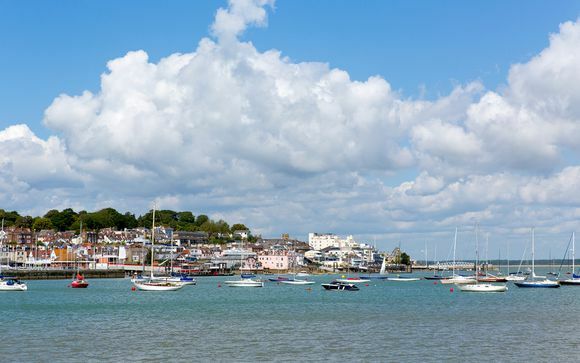 Choose from a one night or two night trips sailing from Lymington, visiting pretty seaside towns such as Cowes Harbour and Yarmouth. Day One: Check in @ Lymington 16:00, depart for Cowes early evening before dinner onboard. Day Two: Breakfast onboard before sailing back to Lymington for check out at 12:00. Day One: Check in @ Lymington 18:00, dinner ashore (not included in rate). Day Two: Breakfast on board. Depart for Hamble and lunch onboard before sailing over to Cowes for the evening with dinner ashore (not included in rate). Day Three: Breakfast onboard before sailing to Yarmouth for lunch onboard then back to Lymington for check out at 16:00. These exclusive trips start at the Yacht Haven in the beautiful port town of Lymington located on the southern edge of the idyllic New Forest - just a short drive from both Southhampton and Bournemouth. After checking in and a warm welcome aboard Bella of London, you’ll head out onto the Solent in the early evening sun to ease into some warm-up sailing with a professional skipper before cruising to your stunning stopover destination in Cowes on the Isle of Wight. Upon safe arrival and berthing in Cowes harbour, you’ll get the opportunity to sit back, relax and take in the views whilst enjoying a freshly-prepared evening meal onboard Bella before getting the chance to venture out into Cowes’ vibrant, sailing-centric evening scene! After you’ve explored the wealth of quaint pubs and bars that Cowes has to offer, you’ll be able to return to the comfort of your own double cabin onboard Bella for a good night’s rest! In the morning you’ll be able to freshen up at the plush Yacht Haven toilet and shower facilities before being treated to a hearty breakfast, again freshly cooked onboard, before getting the chance to experience a morning of action-packed sailing across the Solent before returning to Lymington in the early afternoon for check out. Throughout your stay, you’ll be looked after by an experienced, professional skipper who’s not only happy to show all guests the ropes but is also focused on ensuring you leave Bella with an authentic sailing experience you’ll never forget. This extended trip gives you a chance to explore even more more pretty coastal towns such as Hamble and Yarmouth. This more leisurely pace would suit those seeking a little more relaxation and the chance to really unwind over three days. Please note that your contact details will be sent to the local team so that they can make contact with you in advance of your arrival to discuss various aspects of the booking. Bella of London is a beautiful 50' Italian inspired Grand Soleil luxury yacht, berthed in Lymington at the Yacht Haven. As a luxury yacht, Bella of London is all about delivering an unforgettable and authentic yachting experience. Below deck, Bella welcomes you with the elegance of a London club. 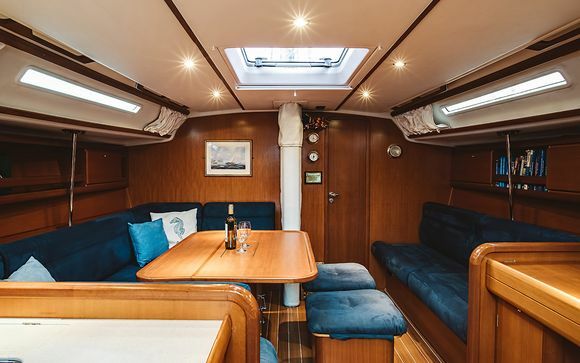 Beautifully finished throughout in teak and furnished very comfortably, this private yacht is a wonderful place for enjoying great food, practicing your navigation skills when learning to sail or just simply relaxing. This offer is based on a Double Room or a Double En Suite Room. 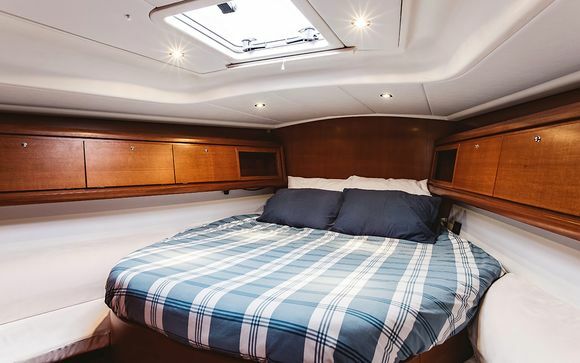 Bella of London has a tri cabin layout with an impressive master cabin in the bow, which includes a large double island berth, twin settees, and en suite heads with shower, wash hand basin and sea toilet. There's an L-shaped galley located to port comprising a gas hob with oven and grill, two fridges, a sink and multiple storage lockers. The enormous saloon has a large dinette and second settee. Bella of London is located at the Lymington Yacht Haven.